A group of pro-Palestinian activists has organized a new flotilla to make another attempt at breaking Israel’s Gaza Strip blockade, initiated in 2007. The flotilla, which consists of at least three ships, has sailed out from three Mediterranean Sea ports. 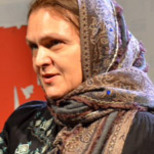 The launch date and list of participants had been kept secret, although it was known that among the activists are a former Tunisian president, as well as athletes, academicians, parliamentarians of different levels, diplomats and journalists, and a Catholic nun. Dror Feiler, 63, is a well-known musician and installation artist from Sweden. He has participated in all of the attempts to break through the Gaza blockade. He was born in Israel, served in the Israeli army’s support force, and immigrated to Sweden 40 years ago. His parents are well-known anti-occupation activists in Israel. His mother still lives in Israel, but he has been denied entrance to the country. He can’t enter Israel for any reason, not as part of the flotilla nor to see his mother. He can’t even get to the court to pick up the verdict explaining why he has been banned from the country. “They’ve kept my saxophone for five years now – it was confiscated during the arrests of the First Flotilla, and they aren’t giving it back,” says the musician. “It is possible we won’t reach Gaza, but we will reach many hearts that will beat together with Gaza,” says Dror. “We must go because our politicians fail to do their job – they fail to put enough pressure on Israel to lift off the blockade on land and sea,” he says. In 2004, Feiler created an art installation in support of the Palestinians: he sailed a little white ship in a tank of water tinted with red paint, with a portrait of a Palestinian woman who blew herself up in an attack on a checkpoint. The Israeli Ambassador to Sweden, who visited the exhibition, reacted by drowning the lights of the piece in the tank. In a 2011 effort to reach Gaza, Dror was on the only boat of the flotilla’s 11 that actually attempted to break the blockade, as unknown persons had succeeded in sabotaging the other 10 boats right before launch. Ana Miranda, 44, is a Galician politician and Vice President of the European Free Alliance (EFA) European political party in the European Parliament that champions self-determination for repressed peoples. She was a MEP from 2012 to 2013. Now, she is participating in the flotilla and has brought a group of journalists with her. “Galicians have the fight for freedom in their blood. I am a deputy, but we live like ordinary people – we ride on a bus, go about daily chores like all people and know all the hardships of the common people’s life. This Flotilla is the symbol of resistance for the entire world. 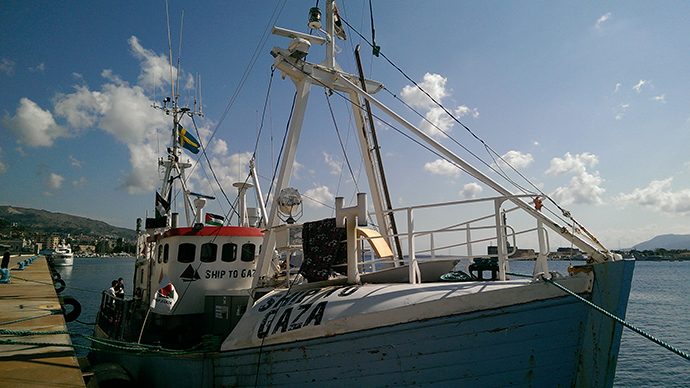 The Flotilla for the freedom of Gaza is the banner of all who resist,” she said. Norwegian Professor of Sociology Gerd von Der Lipper has long been studying the problem of sports in Gaza or, to be more precise, the problem of the absence of sports infrastructure or the ability to participate in sports in Gaza. “Forward, people of the entire world – that’s the message of the Flotilla of Freedom,” she said. One of the Flotilla’s crews held a meeting right under a huge Last Supper painting in the mayor’s office in the city of Messina, Sicily. Despite their different religious beliefs, all the participants kept looking up at it, as the implication of this painting for them was all too clear: Israel is doing all it can to stop the flotilla before it even sails out. Before the flotilla sets off, all crews are trained on how to properly resist violence in a peaceful way. Everyone, including the journalists, is taught how to behave if Israeli soldiers take over their boat. In this event, it is possible that they will be held without food or water in the sun for many hours, and have their phones, money, bank cards and personal belongings confiscated, including recording equipment and cameras.